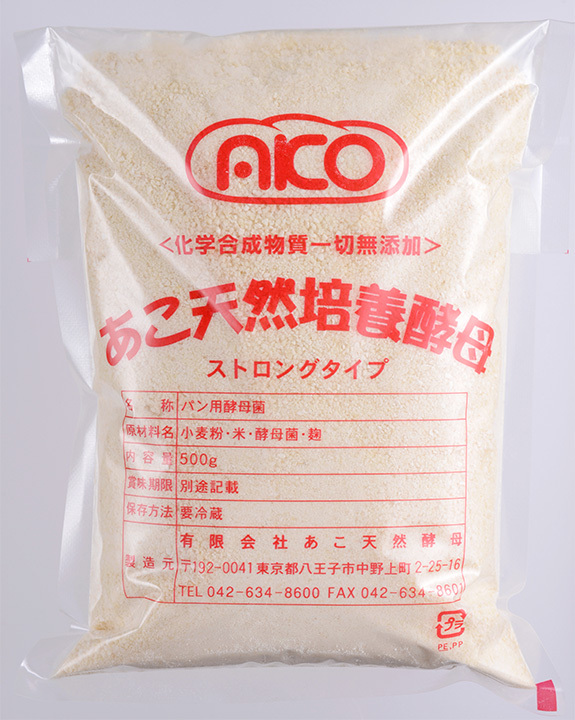 AKO Natural Cultured Yeast Enjoy a mild taste that captivates you. We provide you with a unique yeast which has been nurtured using the technique that our president has acquired in over 40years. The essence of bread is on the flour. The flour is the responsible for the taste. 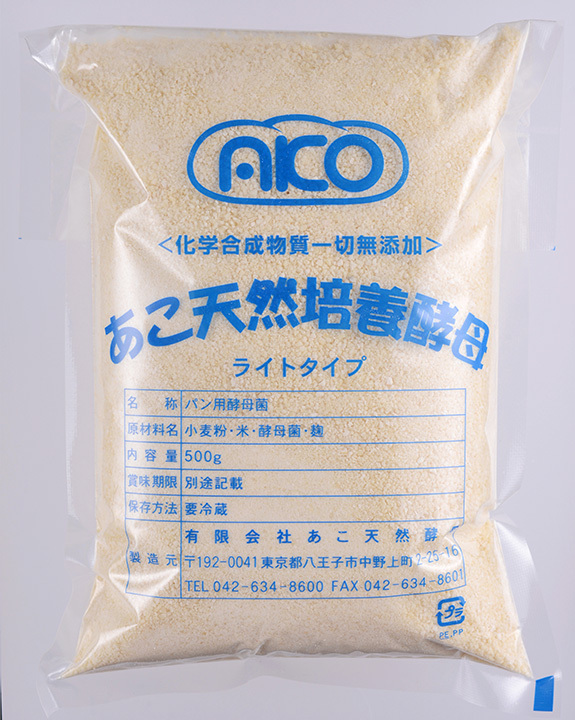 Ako natural cultured yeast has “ Umami”, the sixth kind of taste, and has no artificial flavours like that of Miso and Soy sauce by an enzyme. It has “the pure flavour of flour”. Only when you taste and feel such things, can you prove that they are “ fermented food “ Ako Natural Cultured Yeast will lead you to the real world of bread ! There are two kinds of yeast you can use depending on what you would like to bake. It is best used for a soft bread such as a loaf of bread, sweet buns . It is best used for a hard bread such as baguette, German bread. It needs to be activated before use. Here is the instruction of how to activate AKO Natural Cultured Yeast. ① Ｄouble the amount of lukewarm water from the amount of Yeast in a clean pot. ※It should be ４０℃. ② Stir the Yeast with a whisk and make sure to keep doing it following a single direction to avoid lumps. approximately 24hours to 30 hours. ★Leave it until the Yeast seems completely melted and get a strong taste like alcoholic beverage. ④ Leave a small air way somewhere on the surface of the pot itself or just lightly put the cover since the Yeast requires some air. Otherwise, the yeast get weak and could produce a sour taste . *It can stay fresh for about 10 days as long as it is refrigerated. ※Regulate the amount of water by flour you use. Mix all ingredients in a bowl of a stand mixer. Allow the dough to mix for 1 minute at low speed and after that 3-5 minutes at medium or second low speed for the flour and the other ingredients to properly hydrate and blend with the water. Make sure the amount of the dough can fit well into the size of the bowl. If not, the gluten can not extend as it should be and its flavor can also be detracted. A kneading temperature should be 20~22 degrees. Basically,it requires “overnight Ferment” that brings you better results in the taste and work efficiency. Leave the dough for 12-16 hours in a dough conditioner or a final proofer with a temperature set at around 20 degrees. Dividing・Round cell ☆Rounding machine can be used. Divide the dough into 400g sizes※dough pieces and make sure to touch the dough gently but not punch the dough down. Roll the dough up into balls as if rolling only the outer surface of skin out . ※	You can adjust the size of the dough pieces with the pan you have got. Leave the dough for 40-60 minutes in a dough conditioner or a final proofer with a temperature set at around 30-32 degrees. ※	Bench time is determined by how much the dough rose at the first fermentation process. Moulding ☆moulder machine can be used. Punch the dough down very carefully and gently. After that ,make sure not to let the outer surface of skin tear when it is rolled up. Place the dough balls into a pan. ※	To get a better oven kick ,choose a narrow and high pan. Leave the dough for more than 1hour～2hours to let it rise in a warm place which should be less than 35 degrees. Recommended temperature is from 30 degrees to 32 degrees. When the top of the dough in a pan rises up to the edge of the pan or about 5mm over the edge is a timing for baking. It should take approximately 40 minutes with around 160 degrees temperature at the top heat and around 220 degrees temperature at the bottom heat. Just make sure to start at 160 degree to get more volume in your bread.Only when it is started to bake at low temperature, the gluten in the dough can extend enough without getting spoilt. Copyright (c) 2016 - 2019 有限会社あこ天然酵母 All Rights Reserved.